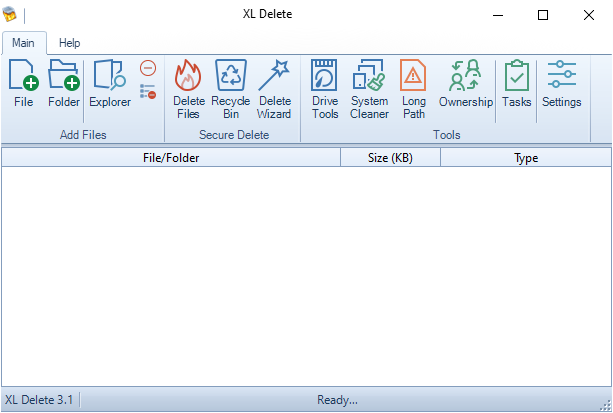 XL Delete is a powerful secure delete tool that will permanently delete files using its powerful wipe engine. XL Delete can permanently remove any type of file, entire folders, and even your Internet Explorer, Firefox, Chrome, and Safari cookies, history, and cache files. Many people believe that emptying the recycle bin will delete a file forever. This is not true, when you delete a file and empty it from the recycle bin, the file is in fact still on your hard drive. The only thing that happens when you empty the recycle bin is that Windows marks the area where the file is on the hard drive as overwriteable so that it can reuse the space when necessary. This allows special data recovery software to be able to actually undelete the file and view all of its original contents. Prevent hackers and identity thieves from going through your deleted files and finding your passwords, credit card numbers, and other private information. When you delete a file with XL Delete, the file data will actually be overwritten several times using specialized methods to prevent data recovery software from being able to undelete the file. XL Delete will also incorporate several obfuscation techniques to hide the original file name and file size from data recovery software. You can be assured that once you delete a file with XL Delete, it will be gone for good. - Improved support for cleaning Microsoft Edge cookies, cache, and history files. - Fixed error that could happen when trying to take ownership of files owned by Windows.